Before creating a Tenant we should know what is a Tenant in OpenStack or in Huawei Fusion Cloud? A Tenant is a project in OpenStack that use to isolate resources in a cloud environment and the users of the allocated resources. 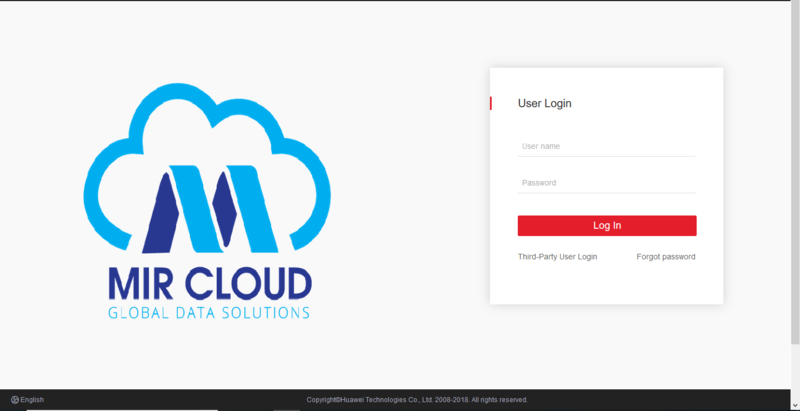 Cloud environment consists of a pool of various resources and you create tenants to easily allocate parts of the total resources to your clients and easily maintain them. Creating a Tenant automatically creates a First Level VDC(Virtual Data Center) in fusion cloud. Huawei Fusion Cloud permits at most Five Levels of VDCs to use the resource quotas given in a Tenant. Login to the Service Center(SC). Successful login will land you to the Tenant Management page where you will have the listings of all the current Tenants in the cloud. From this page top right corner select Create Tenant will load the Create Tenant page. Project Name; generally same as the Tenant Name. Create Default Administrator; If you choose YES it will create one now. Provide the Administrator User Name, Password, Confirm Password and optionally Email and Phone which are useful in many cases like password retrieval or notification of operation, etc. 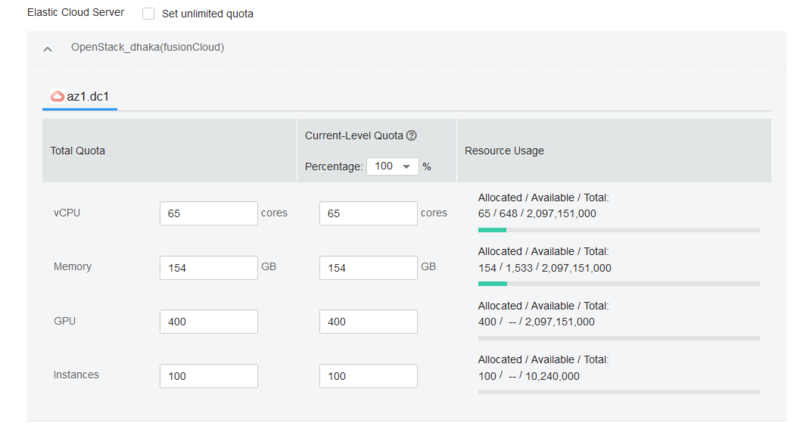 Enable VDC Service(Optional): Here you mention or supply the resource you want to allocate to the Tenant and from which resource pool or available zone of your cloud infrastructure. Under Resource Pool select all the resources you want to allocate. Choose the Elastic Cloud Server zone. Choose the Image Management Service available. Choose the Elastic Volume Service zone. Choose the Virtual Private Cloud available. Choose the Server Groups available. After you choose from the above list Resource Quotas will be available enabling you to mention the quota. Provide the resources to the quota and optionally choose Associate Approval Process with Quota Modification to YES if you planned to use approval process for quota management. Select Create from bottom right of the page will create the Tenant as well as the First Level VDC. Under the Tenant Management page your created tenant will be listed top. For Dummy_External_Network select Allocate under the Operation column. 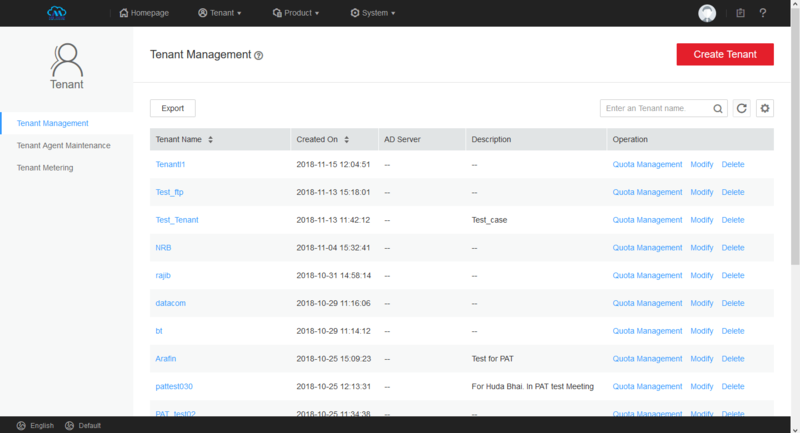 This will enable the VDC administrator to create VPCs. That’s it, Tenant is created. Next you should create VPCs and ECSs for your applications computing need.